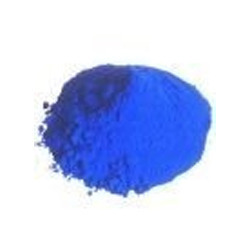 Supplier & Manufacturer of Reactive Dyes & Reactive Blue Dyes. Our product range also comprises of Basic Dyes, Food Colors and Solvent Orange 3. It is known as CORANTES REATIVOS in Brazil. It is known as COLORANTES REATIVOS in Mexico, Colombia, Peru, Argentina, Paraguay, Uruguay, Chile, Guatemala, Honduras, Costa Rica, Nicaragua. Reactive dye is a class of highly colored organic substances, primarily utilized for tinting textiles, that attach themselves to their substrates by a chemical reaction that forms a covalent bond between the molecule of dye and that of the fiber. The dyestuff thus becomes a part of the fiber and is much less likely to be removed by washing than are dyestuffs that adhere by adsorption. The very first fiber-reactive dyes were designed for cellulose fibers, and are still used mostly in this way. There are also commercially available fiber-reactive dyes for protein and poly amide fibers. In theory, fiber-reactive dyes have been developed for other fibers, but these are not yet practical commercially. The dyes contain a reactive group that, when applied to a fiber in a weakly alkaline dye bath, form a chemical bond with the fiber. Reactive dyes can also be used to dye wool and nylon, in the latter case they are applied under weakly acidic conditions. The most important characteristic of reactive dyes is the formation of covalent bonds with the substrate to be colored, I. E. The dye forms a chemical bond with cellulose, which is the main component of cotton fibers. Fiber reactive dye is the most permanent of all dye types. Unlike other dyes, it actually forms a covalent bond with the cellulose or protein molecule. Once the bond is formed, what you have is one molecule, as the dye molecule has become an actual part of the cellulose fiber molecule. No wonder you can safely wash a garment that has been dyed in bright fiber reactive colors with white clothing, a hundred times, without endangering the whites in the least - even if it is all different bright colors, or even solid black! In contrast to all other dyes the reactive dyes bind chemically to the textile fibres, significantly improving the product's colour stability and washability. Thus reactive dying of cotton is currently the most widespread textile dying process in the world. We 'Megha International' engaged in manufacturing of dyestuffs since last one decade. Reactives dyestuffs are one of series apart from the direct acid & acrylic range of dyestuffs. 'Megha international' presents the textile dyers & printers with a very wide range of reactive dyes, which are suitable to various dyeing & printing of cellulose fibre. Dycrofix 'm' dyes : These are called 'cold brand dyes' these dyes are having very good reactivity fastness properties. These dyes require milder alkaline conditions for applications & fixation at the optimum temperature of 25-35 deg. C.
Dycrofix 'h' dyes : These are named as 'hot brand dyes' these dyes are applied under strong alkaline conditions at high temperature of application compared to 'm' dyes. These dyes contains very good fastness properties to wash, perspiration, light etc. These dyes are suitable particularly for printing cotton, viscose, cuprammonium rayons & natural silk. 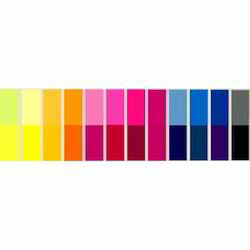 Dycrofix vynil sulphone dyes : These are vinyl sulphone based reactive dyes widely used for dyeing & printing of cellulosic fibres for its very good fastness properties. These dyes are having very good features like, good solubility even in presence of alkali, very good fastness properties, can be applied both by exhaust & padding methods, possesses less affinity hence very good leveling property & suitable for resist & discharge printing very much effectively. These dyes are applied by exhaust method at the optimum temperature of 60-65 deg. C.
Dycrofix 'he' : These are bi functional reactive dyes. Which are having two reactive maltese of the same type viz monochloro triazinyl. The chromogen of the colour is supported through a stillbene in the molecule. This structure provides good light fastness and as well good washing fastness because of having high molecular weight.